Introducing our brand new black tall centre showcases for hire which are the perfect solution for professional companies wanting to showcase their products at trade shows and exhibitions. Typically, display showcases are grey or silver with glass. Our black and glass showcases, therefore, providing a fabulous option for your upcoming B2B event. They are made with tempered glass panels and 4 interior tempered glass shelves and have LED lights in-built to really help showcase your company products at their finest. Also, as you would expect, the cabinet is fully lockable. 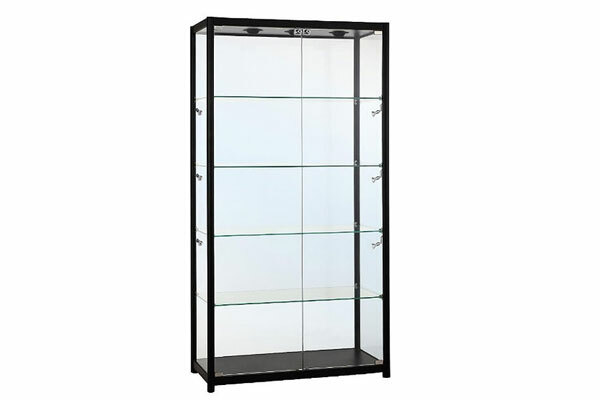 These black display cabinets for hire are an integral part of our wider display showcases range here online at Event Hire UK where we also offer the full range of glass showcases, some all glass and some with cabinets. In turn, this range is part of our wider furniture hire range which is ever-expanding to meet the ongoing needs of our valued clients. You can rest assured that your upcoming event and exhibition requirements will be met with effectiveness and efficiency from Event Hire UK's nationwide network of sales and distribution centres, including our most recently-opened hub in Manchester. Contact us today and speak to one of our expert sales team who will, as always, be delighted to assist.